James Valcq in Third Avenue Playhouse’s production of “Velvet Gentleman.” Photo by Len Villano. Velvet Gentleman returns to Third Avenue Playhouse (TAP) for the holiday season. The play is a colorful journey into the mind and music of the witty and eccentric composer Erik Satie, whose music ranges from comically bizarre to hauntingly beautiful. 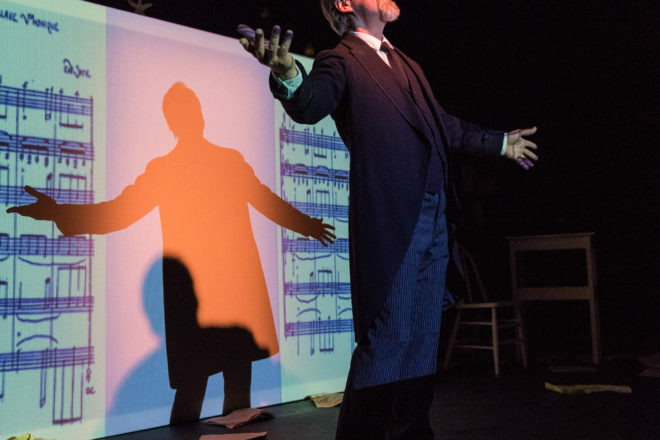 Created and performed by TAP’s co-artistic director James Valcq, this multimedia theatre piece featuring Satie’s music, words and drawings will transport audiences to fin-de-siècle Paris. Performances will be held Dec. 19-31, Wednesday to Saturday at 7:30 pm, and Sunday at 2 pm. There will be no performance on Dec. 26. A special News Year’s Eve performance will be held Dec. 31 at 7:30 pm. Tickets are $28 for general admission and $12 for students. For more information, visit thirdavenueplayhouse.com.